When HIPAA, temp agencies, and recordkeeping cross paths, who wins? Most employers utilize temp workers at some point. And, while you hope it doesn’t happen, there is the possibility that the worker will suffer a work-related injury. If, as the host employer, you supervise the daily activities of that worker, then any injuries meeting OSHA’s recording criteria would go on your log. 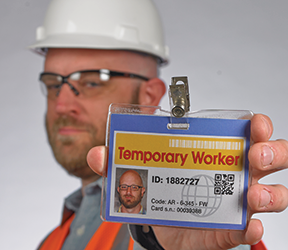 But, often what happens is the temp worker doesn’t come back to your facility during the injury (or after recovery). How, then, are you supposed to know whether the case is recordable? And, if so, how many days have been missed or restricted? In an ideal world, your temp agency contact will provide you the information you need for accurate recordkeeping. But, there are occasions when the temp agency will claim they are prohibited by HIPAA (the Health Insurance Portability and Accountability Act) from providing information about an employee’s medical status. The fundamental requirement of the HIPAA privacy rule is that covered entities may not use or disclose protected health information (PHI) without the written authorization of the person who is the subject of the information. However, the privacy rule includes several exceptions for disclosing PHI without individual authorization. See, 45 CFR 164.512, Uses and disclosures for which an authorization or opportunity to agree or object is not required. The exception at Section 164.512(b) provides that a covered entity may use or disclose PHI for public health activities. Most importantly, Section 164.512(b)(1)(v)C) specifically permits a covered entity to use or disclose PHI in order to comply with obligations under OSHA’s Part 1904. Accordingly, in situations where a temporary staffing agency meets the definition of a covered entity, Section 164.512(b)(1)(v)(C) would permit them to disclose PHI to the controlling employer for purposes of compliance with Part 1904. If they still won’t release the records? Refer them to the OSHA Letter of Interpretation, 01/12/2018 - Recording Injuries and Illnesses of Temporary Workers versus HIPAA Requirements. Do you know how effective your HazCom training was? The Workplace Safety Advisor Newsletter keeps busy safety professionals current on the latest workplace safety and compliance news, consensus standards, and best practices. Click Here for a free, no-obligation trial.